Two new articles about Frank James drew our attention last week. 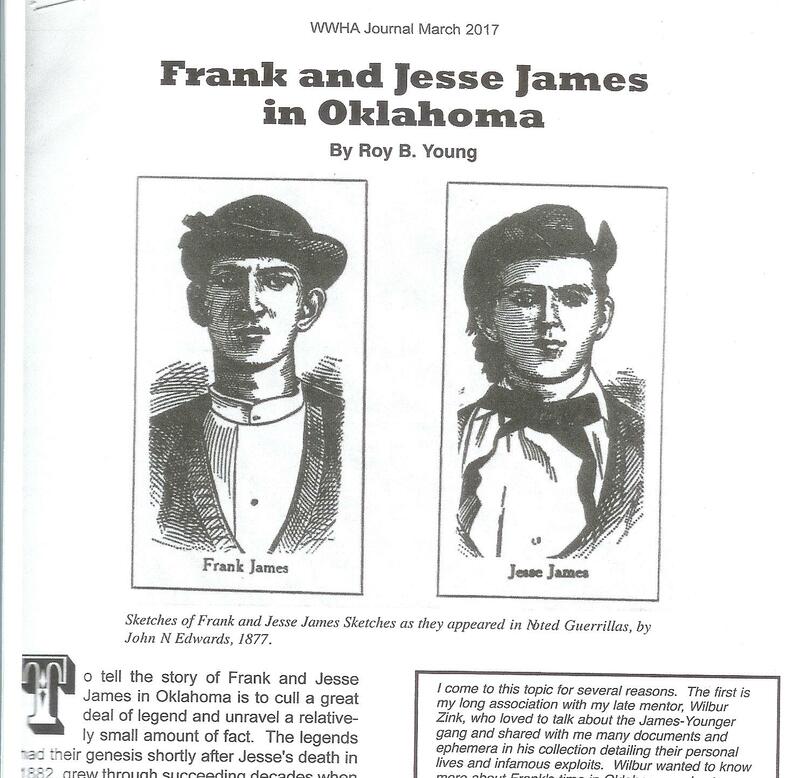 The Wild West History Association just published an informative article in their WWHA Journal, March 2017, about Frank James in Oklahoma. The article is written by Roy B. Young. The article shows Frank James was framed. The face of the article, which is more about Frank James than Jesse James, presents an old-timey vibe, reminiscent of western pulp magazines of more than fifty years ago when sensationalism was the rage. Regretfully, the article then begins with the fake-news subject of treasure hunting for Jesse James hidden gold in Oklahoma. You have to leap past that hurdle and another hurdle at the end to get to the meat of Young’s story that is bonafide and new. Roy B. Young employs the current rage of culling old newspapers, many now online, to tell a story either overlooked, forgotten, or not present in today’s history consciousness. Having culled most of these papers myself in their original depositories for a couple of decades, I noted a lot of familiar information in Young’s story. My forthcoming Volume IV of Jesse James Soul Liberty quintet is a biography of Frank James in his retirement years. Informed as I think I am, Roy B. Young found lost history I did not know about. I’ve expressed my thanks to him for writing it. Nothing tickles a historian more, than learning something new he didn’t know. Regrettably, Young ends his well-done story of Frank James, writing about the Jesse James imposter J. Frank Dalton. Why Oklahoma feels it necessary to include fake news as a necessary component to its true history is beyond me. Sensationalism calls into question any factual or true history associated with it. This article would have truly been a superior one had it not been for the bookends of treasure hunting and J. Frank Dalton, framing it. Forget for now Frank James being framed in this manner. Grab the fresh history Roy B. Young now offers anyway. Then wait for Jesse James Soul Liberty, Vol. IV, Frank James in Retirement to address Young’s speculation and provide you even more unknown history about Frank James in his retirement years. The second article about Frank James comes from the Osage County News. Wendi Bevitt writes about the visit of Frank James to Burlingame, Kansas and the 1899 Osage County Fair. Prior to writing her story, Wendi queried us about Burton Allen James, Indian Agent from the James family for the Sac and Fox Reservation. She also queried about Perry Fuller, the onetime business partner of Frank and Jesse’s uncle Thomas Martin James, whom I also wrote about in Jesse James Soul Liberty, Vol. I. Since Volume IV of JJSL will address Frank James in his retirement, I was pleasantly surprised to read the outcome of Wendi’s article. 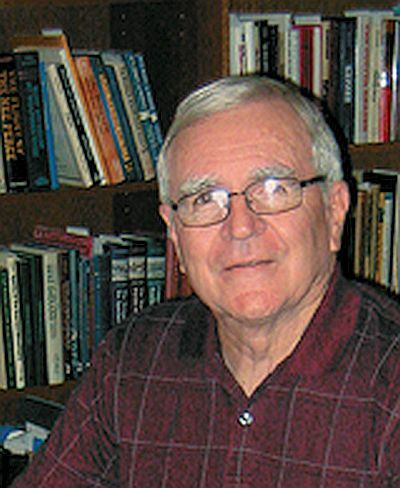 Much of her story is focused upon Frank James in his career as a public speaker and as a race starter when he appeared in 1899 at the Osage County Fair. Like Roy Young’s reporting on Frank James, Wendi Bevitt’s article brings fresh history into view. 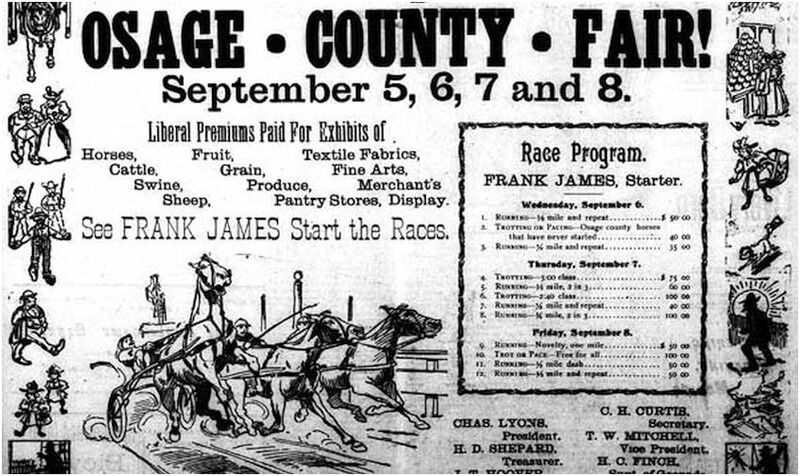 The freshness is in the details, such as how Frank James started a race. Excerpt – He would stretch an immense rubber rope across the track and when the racers were at their mark, he would let the rope fly free. Interesting, too, is the behind the scenes arrangements of a Frank James speaking engagement. History like this has not been published before and is a welcome addition to the historical record. WENDI BEVITT is the owner-operator of Buried Past Consulting LLC, a firm specializing archaeological surveys, historical research and report preparations for both public and private sector clients. 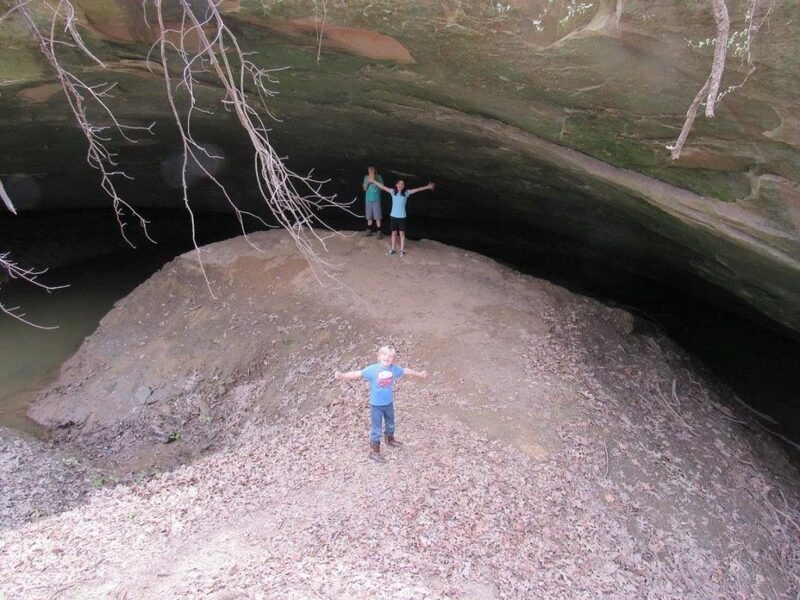 Jesse James Cave, located on the Sac-Fox Reservation in Osage County, Kansas, is visited by Wendi Bevitt’s children.